On September 28th, more than 300 people gathered at the Potawatomi Hotel & Casino in Milwaukee, WI, for the Metropolitan Builders Association (MBA) Achievement Awards ceremony. The event honored builders who participated in the recent 2018 Parade of Homes. The awards were determined by a panel of judges selected from members of the Madison Area Builders Association (MABA). Also, during the Parade, the public was invited to tour the homes and vote on which was their favorite in each subdivision. The selections with the most votes received the People’s Choice Award for Best Overall Home. Developments in Sussex, Brookfield, and Summit were chosen to take part in the 2018 Parade of Homes. In the Sussex subdivision, Joseph Douglas Homes built a popular split bedroom ranch. With many custom features, the 3,809 sq. Ft. French country residence has an impressive roof-line and a grand porch. The entry opens to a stunning great room, perfect for entertaining. A large kitchen with a generous island has plenty of storage and counter space, with formal dining nearby. The master suite is separated from the other bedrooms by the center living areas. The luxurious suite boasts plenty of space for a sitting area, king-size bed, and two walk-in closets. A private bath offers a dual vanity, a shower big enough for two, and a separate water closet. The other end of the first floor has yet another bedroom suite with private bath. A spacious laundry room is nearby, plus a guest powder room and convenient mudroom. The finished lower level is the perfect place for a teenage hangout or party overflow. It includes a bar, theatre area, and billiards room. The lower level is completed by a third bedroom suite with full bath, and an exercise room. 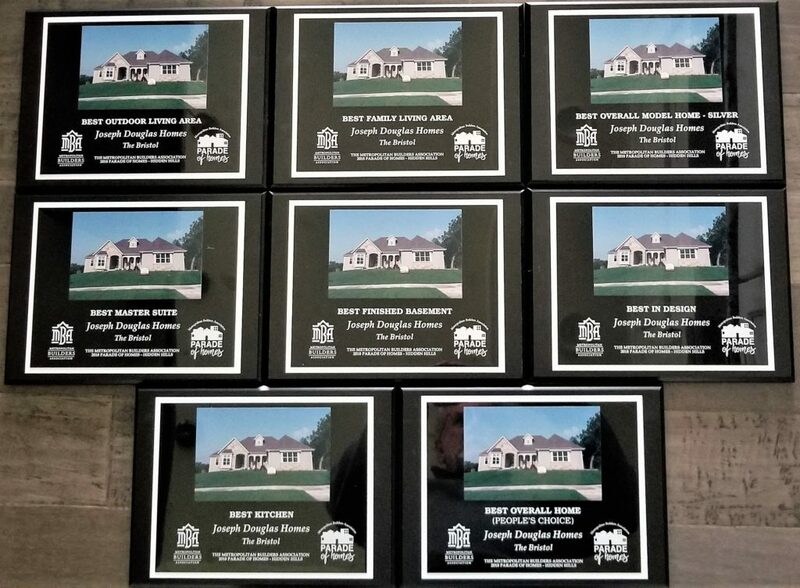 Joseph Douglas Homes is one of Wisconsin’s best custom home builders. With a Better Business Bureau rating of A+, Joseph Douglas Homes has been building unique, quality custom homes in Southeastern Wisconsin since 1998 and is featured every Saturday morning on the network tv show Builders Showcase Television.